ISO certification acquisition | Company information | KISHIDA CHEMICAL Co.,Ltd. 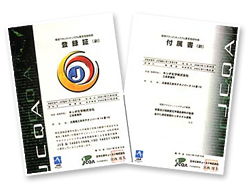 In November 2001, Sanda Works obtained ISO 14001 certification. We are actively working on effective uses of limited resources and the preservation of the global environment. We wrestle with activities to minimize influence on environment. As a part of such activities, Sanda Works obtained ISO 14001 certification. We will strive to maintain and continuously improve the established EMS and to contribute to the preservation of the global environment.